On Monday, it ended as we feared it would. Reports surfaced that the Israeli Defense Force had discovered the lifeless bodies of Eyal Yifrach, Gilad Shaar and Naftali Frankel, the three Israeli teenagers kidnapped a little over two weeks ago. Our hearts go out to the families. We urge prayers of comfort for them during this time. And yet, as the families come to terms with the deaths of their loved ones — young men filled with such potential — the world is forced to come to terms with displays of raw hatred. And yes, there is nothing more hateful than murder. But the hatred displayed in this story is particularly bizarre. On Thursday, Israeli security officials named two Palestinians — Amer Abu Aysha and Marwan Kawasme — as “key suspects” in the kidnapping. Both men are reportedly Hamas members from Hebron, where the bodies of the boys were found. Abu Aysha and Kawasme disappeared at the same time as the teens and have not been seen since. The Blaze reports that in an interview with Abu Aysha’s mother, the woman declared, “If he did the kidnapping I’ll be proud of him … I raised my children on the knees of the (Islamic) religion; they are religious guys, honest and clean-handed, and their goal is to bring the victory of Islam.” When we read that, there was a moment of stunned silence. Palestinian Arabs attacked an Israeli Defense Forces (IDF) ambulance humvee on Monday that was transporting the recently discovered bodies of three murdered Israeli boys who were kidnapped on June 12, an Israeli source told The Algemeiner. In the picture, the ambulance’s windshield is shattered and splattered with paint. The hatred here is particularly palpable. It is real, and it is unrelenting. Israel is surrounded by aggressors. We must never forget that in their heart of hearts, the Arab world is at war with Israel. We have, since its founding, been their ally, and it is moments like these that should rouse us from our dreamlike apathy; it is moments like these that should instill us with rage at how hostile the current administration has been to our ally, and how hard they’ve worked to cozy up to those whose sworn mission is Israel’s utter destruction. This is no game; it is war. It is life and death. 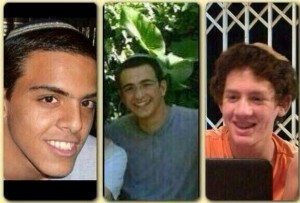 And the result of the Obama Administration’s aid and comfort to Israel’s enemies through its foolish efforts at “soft diplomacy” can be seen today, mirrored back at us through the dull, hollow eyes of three dead Israeli teens.